The Supermind has to actually create the world of multiplicity and hence the indivisible and unitary triune of Existence, Consciousness- Force and Bliss have to be delinked in terms of Mind, Life and Matter which is our view of the universe. This is executed by a second operative principle of the Supermind- ‘ a projecting, confronting and apprehending consciousness in which knowledge centralizes itself and stands back from its works to observe them’ (The Life Divine, pg 151). Now, the hallmark of this ‘centralization’ of consciousness is that an ‘UNEQUAL CONCENTRATATION OF CONSCIOUSNESS AND A MULTIPLE DISTRIBUTION OF FORCE OCCURS’(Ibid, pg 152-153). This is ‘the beginning of self-division, -- or of its phenomenal appearance’ (Ibid). Thus is produced the multiplicity-the creation- and the multiplicity is comprised by DISTINCT INDIVIDUALITIES. In other words, unique and distinct individual units appear- and there is a great diversity in individual forms to do justice to the phenomenon of multiplicity. Diversity in individual forms automatically denotes an unequal distribution of consciousness. The apprehending principle of the Supermind permits the multiplicity but does not reject the underlying unity- it actually subserves a multiple unity. However, as the apprehending Supermind supports both the unity and the multiplicity, it has to balance the ‘created individual form’ with the ‘uncreated, formless consciousness’. In the process, it generates the concept of a PERSONAL GOD, the status of the Divine that permits the unequal concentration of consciousness. 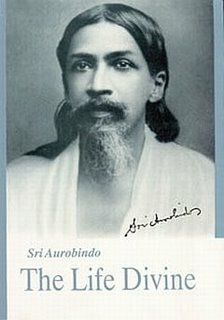 Sri Aurobindo adds ‘We must not indeed exclude the personal aspect of the deity, for the impersonal is only one face of existence; the Divine is All-existence, but it is also the one Existent,- it is the sole Conscious Being, but still a Being’. He also cautions that the true personal Divine must not be equated with the popular occidental conception of a magnified and supernatural Man-‘a too human Eidolon of a certain relation between the creative Supermind and the ego’,(ibid,pg143) – an anthropometrical God! How and why does the concept of personal God develop? The Knower - is the inseparable unitary consciousness that is present as a ‘soul-essence’ in each creation, in each created from, upholding and supporting creation. The Known - is the ‘energy-essence’ or dynamic Force or Shakti that is coeval and commensurate with the creative idea so that the idea is actually executed. The energy that executes the creative Idea can also be withdrawn to dissolve the idea just as an artist can create and also destroy his own creation. The soul-essence of each created form can get replicated in endless other forms, producing the multiplicity of creation. First of all, the Knower holds himself concentrated in knowledge as subject and regards his Force of consciousness as if continually proceeding from him into the form of himself, continually working in it, continually drawing back into himself, continually issuing forth again. From this single act of self-modification proceed all the practical distinctions upon which the relative view and the relative action of the universe is based. A practical distinction has been created between the Knower, Knowledge and the Known, between the Lord, His force and the children and works of the Force, between the Enjoyer, the Enjoyment and the Enjoyed, between the Self, Maya and the becomings of the Self. The creation or Multiplicity is not a monotonous affair. It is rich, variegated and complex. The richness and variety is maintained by an unequal distribution of Consciousness and Force. Yet even in that unequal distribution, the inseparable, equable, unitary consciousness is present as an Essence that supports, upholds, and maintains each created form. This is the metapsychological basis of the actual personal God- not the magnified Man of the occidental; traditions. One can have a ‘personal’ relation with this personal God- a relation in knowledge or a relation of devotion or a relation in service. Or else, it might be a relation of total, complete and holistic surrender of the devotee-consciousness. Though the Knower, the Knowledge and the Known start to differentiate in the apprehending Supermind, the basis is still the ‘unity’. That sense of unity is lost at the level of the Mind. That is why it is said that Ignorance starts at the level of the Mind where reality is expressed as multiplicity. Still, some sort of harmony has to be maintained at the level of multiplicity. This semblance of harmony is provided by the false sense of unity imparted by the ego. To get back to the true unitary consciousness, one must begin by working on the ego. This is why all spiritual traditions insist on surpassing, transcending or replacing the ego. That is the journey back to Godhead.